Post-translational modifications (PTM) are key regulators of cell state. Through our multiplexed PTM analysis we provide comprehensive characterization of the modified proteome. Potential applications include drug / dosage response, longitudinal studies, and high replicate analyses for high statistical power. A cluster of protein sites (right side of heat map) exhibit a marked increase in phosphorylation occupancy. 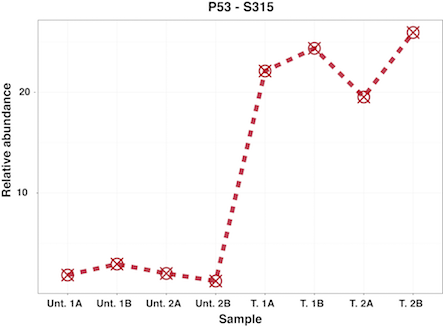 The phosphorylation site (serine 315) of p53 exhibited a near infinite change in occupancy following DNA damage.